A couple of crimefic reviews to catch up on today. First up, Lord Peter by Dorothy L. Sayers. The Abominable History of the Man With Copper Fingers. The first story in the collection and one of those stories retold in a men's club by an actor about his experiences of a famous wealthy man and his penchant for revenge. Genuinely menacing and creepy. The Unprincipled Affair of the Practical Joker. A phantom coach and horses with a headless driver story. Was not expecting that from Dorothy L. Sayers! Honestly, this was a 'cracking' yarn. I loved it. The Learned Adventure of the Dragon's Head. Wimsey is looking after his young nephew who is recovering from an illness. He takes him to a bookshop where said nephew buys an old book of weird drawings. Then the owner tries to get them back. Why? This one was an absolute joy. Loved it. The Image in the Mirror. A man is reading an H.G. Wells story, The Plattner Experiment, about a man who was blown into the fourth dimension and came back with all of his organs reversed. The man tells Wimsey that he was bombed in WW1 and also came back with his organs reversed. Absolutely fascinating story and I must dig out the original Wells' story. The Incredible Elopement of Lord Peter Wimsey. An adventure set in the Pyrenees. A doctor is living an isolated and lonely life with his wife in the mountains. Village gossip has it that the wife's mental state is very bad but she was fine when she arrived. This one has Wimsey pretending to be a magician... great stuff and huge fun but also quite an air of menace about it too. The final two stories involve Wimsey and Harriet Vane becoming parents. The Haunted Policeman has Wimsey outside having a smoke after the birth of his first son. A policemen comes up and tells him a very weird story about a house numbered 13 in which he saw that a murder had been committed but on further investigation the next day turned out not to exist. A really fantastic volume of short stories. Beautifully written as you might expect and, something I didn't really expect, quite weird. I absolutely loved this weird or supernatural tone to some of the stories and several had a real air of menace about them that was unexpected too. As I said before, even the average stories in this book knock spots off some by other authors. Terrific collection. 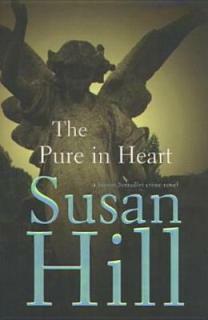 Lastly, The Pure in Heart by Susan Hill. DCI Simon Serailler is in Venice on holiday when he gets a call from his father asking him to come home as his disabled sister is in hospital gravely ill. Having lost a colleague in a brutal manner in a previous investigation Simon is in Venice to recuperate, but answers the summons immediately. Not long after he gets back a young boy is snatched from the street outside his own house, with obvious results for the parents. And an ex-con returns to Lafferton, trying to go straight but will circumstances allow this? Well it's quite a few years since I read the excellent first book in this series, The Various Haunts of Men. I planned to read this second book quite quickly but discovered it was about a missing child. I don't do children being harmed in books very well so I left it, and left it, and in fact it's now 10 years since I read the first book. And that's a shame. Yes, there is a missing child in the story and it is quite heart rending. But the book also focuses on Simon and his family. I won't call them dysfunctional exactly but there are problems, Simon gets on very badly with his father, his mother has always been distant, Simon himself does not treat women very well. The person Simon adores is his sister, Cat, and being with her and her lively family basically keeps him sane. Susan Hill does psychology extremely well, and I like that. She realises nothing is ever black or white and I thoroughly enjoy the manner in which she examines family relationships, crimes, people's motives, with a fine tooth comb. As a writer she is a class act. There is no firm resolution at the end of the book, reflecting life as it often is of course. I gather book 3 continues on with the investigation so have promptly reserved it from the library. I know you like short stories and that book sounded like a top contender! Strangely enough I read The Various Haunts of Men just this year! I need to put up a book post that I just finished.. I've read so few this year I feel like I stopped reading! gads.. I hope that never happens! I haven't read Lord Peter. It sounds a good collection and I hadn't known that Peter and Harriet had three sons - looking forward to reading that some time. I read The Pure in Heart before I had my blog and only recorded that I'd read it and gave it 5*, as I see that you have on Goodreads. As you say, Susan Hill does psychology extremely well. I've just finished reading her Jacob's Room is full of books, which I loved - and 5* book. Pat: I usually find books of short stories a bit hit and miss. This was almost all 'hit'. Some really fantastic tales in it and I really was not expecting 'weird'. Crikey, I hope you never stop reading too! Margaret: Yes, the three sons were a surprise to me too, I knew there was at least one but not three. I suppose if DLS had lived longer she might have written more about them. Jill Paton Walsh has done so I gather and as I have her first book - half written by DLS - I shall try that soon. Yes, The Pure in Heart was well worth 5 stars. I couldn't put it down and ended up reading it in 2 days. I wish I'd got back to the series sooner. It was only because I love Jacob's Room so much that I decided to give the SS series another go and see if I could read book 2, even though it's about child abduction. Glad I did. I read the Serailler series a couple of years ago - listened to a bunch of them. I loved them. Many for the very reasons you listed. The family element was great and Susan Hill had a lot to say about various topics through her crime novels. I was afraid she was through with the series, but the newest is either just out or about to be out. I'm very, very tempted to start at the beginning and read them all again before reading the latest. 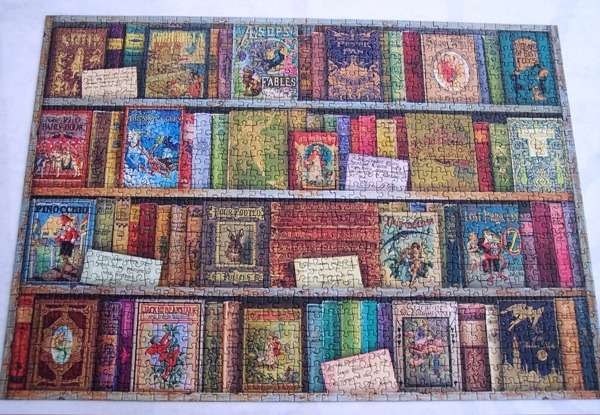 I'm always tempted to do that with Louise Penny's books too. Ha! Glad you enjoyed it and hope you like the series more and more as you continue with it. Susan Hill is one of those authors I keep meaning to try, I even have several of her stand alone stories on my physical bookshelves, but somehow I have just never got around to them. I do also like the sound of the 'Serrailler' series, but I think it is now a little too firmly entrenched for me to make any headway. Kay: Yes, I follow Susan Hill on Twitter and if memory serves she was publicising a new SS book earlier this year. I can quite understand why you feel like reading the series all over again from the start, and Louise Penny's books too, they're too good to only read once. Yvonne: To be honest I'm not generally a big short story fan either. Thus I don't really understand why I keep buying anthologies. But because I can't resist them I thought it high time I read a few, which what I've tried to do this year. Next up - H.G. Wells! As to the Wimsey covers shown on FF, they're OK I suppose, not that struck if I'm honest. And you? There seems to have been a lot new designs recently, GR are showing a lot of headless half-torso ones as well, and there's a sort of noir version from several years ago which I have a couple of. I think it's just nice that the books are still in print and still popular. 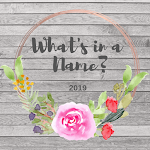 I know, I too have a list of authors I mean to try, then I find the series I'm interested in has 20+ books already and then I'm like you... 'maybe not'. I do sometimes get a bit concerned that people who're kind enough to read my blog and leave a comment might get a bit bored with all the crime fiction I now read. On the other hand, most of those who comment are lovers of the genre too so perhaps it doesn't matter at all. Thank you for highlighting (or spotlighting) mystery or crime stories that you have found to be top-notch. I am taking note of all of them. Great descriptions of each story, too, Cath. I'm eager to begin. In the past I did not read short stories much, so I don't think I ever read these by Dorothy Sayers. I will have to give them a try. I may even have a copy of the book. If not I think it shows up on Kindle at a good price frequently. I read several of the Simon Serailler series but there was a point that I stopped. Not sure why now. But I enjoyed all the ones I read. Judith: My pleasure, Judith. Thanks for your kind words. Tracy: I've never been much of a short story reader either but over the last couple of years I've been converted. Partly due to the BLCC vintage crime reissues I think. My next anthology will probably be by H.G. Wells. I think there's often a point with various series that you come to a halt. It happens to me, I'm not sure why but something in your head says, 'OK, enough now'. Possibly when each book starts to be a bit samey? I'm not sure. 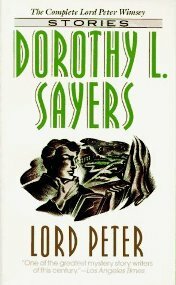 I haven't read, and even haven't heard of this Dorothy Sayers. Thank you. I never am bored by your crime fiction postings. That's mostly what I read on my Kindle. Some are mysteries but I have begun using "crime fiction" for some of them. Have you ever read any of the Rabbi Small books by Harry Kemelman? I'm on my second reading of the series. The first time my kids were still in school! I find them fascinating. Nan: This collection of short stories by DLS is absolutely superb, every story is worth reading and you can't say that about every anthology you come across. And thank you for your kind words. No, I haven't read any of the Rabbi Small books but I believe you've mentioned them to me before and that I may have the first book on my Kindle. The trouble is my Kindle is like a black hole... I put books on there and they disappear for ever, I forget they're there. I need to go through it and read a few next year.